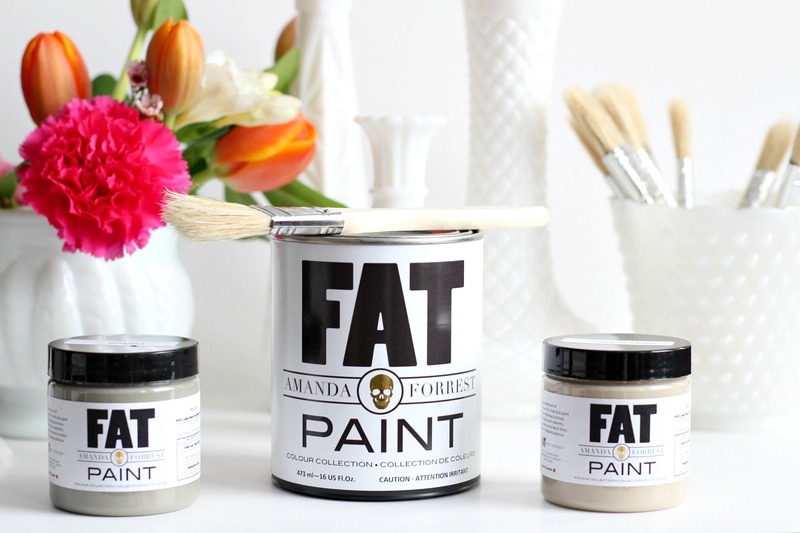 elliven studio: **Giveaway is now closed*** The Amanda Forrest Collection for The FAT Paint Company + A Giveaway! **Giveaway is now closed*** The Amanda Forrest Collection for The FAT Paint Company + A Giveaway! 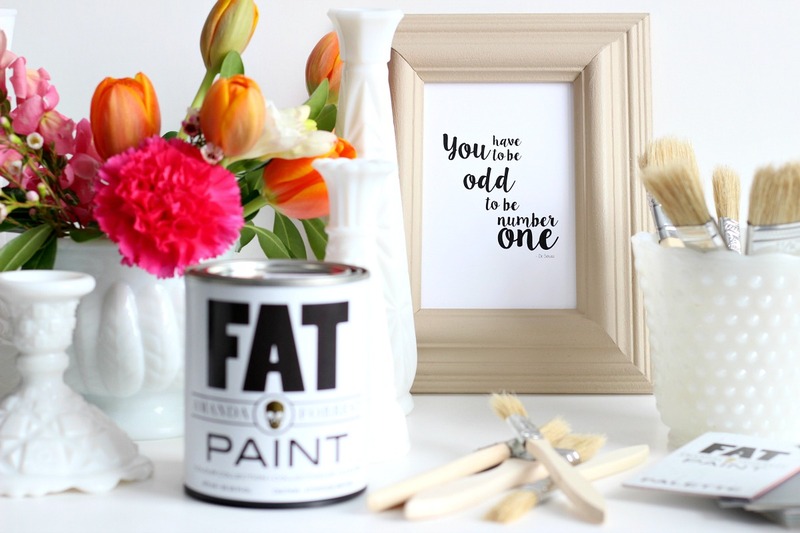 There's no denying the fact that chalk paint is a popular favourite amongst DIYers. 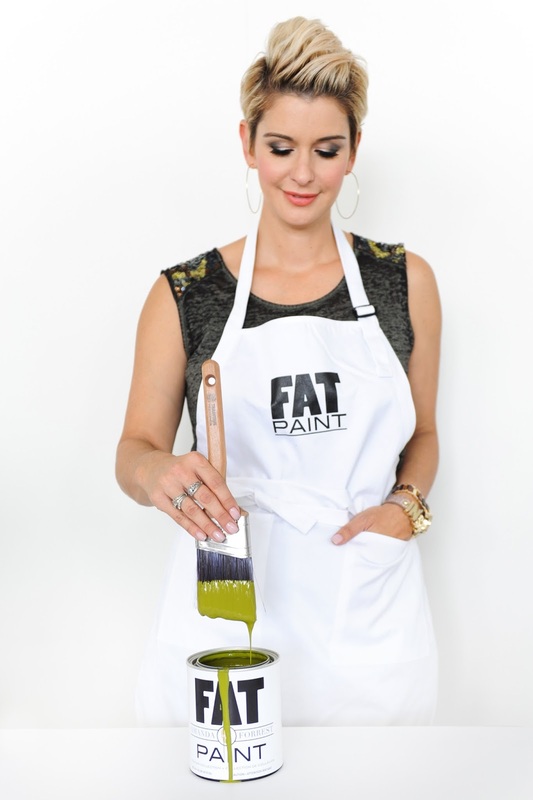 Last September, I had the absolute pleasure of meeting the co-founder of The FAT Paint Company, Victoria. 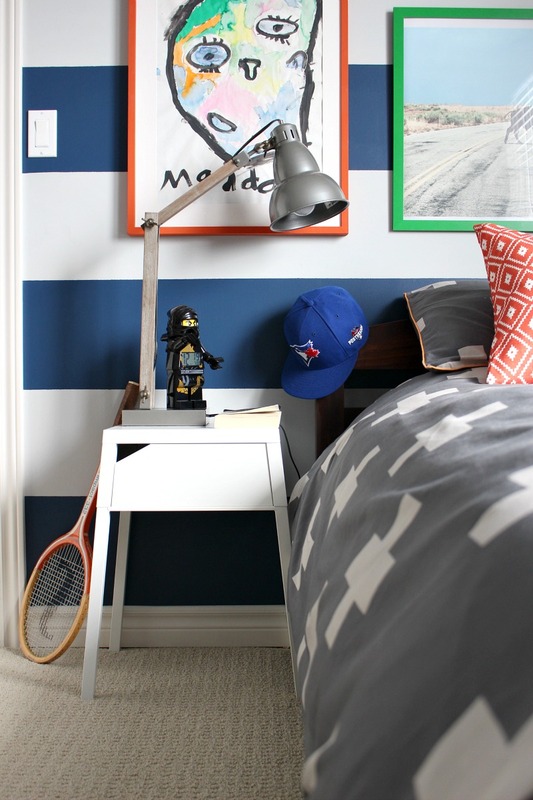 Based in BC, Victoria and her brother, Bradford, have created a fabulous line of chalk-style paint. Would you believe that the original lab was Victoria's kitchen and that they used her kitchenaid mixer to whip up batches of paint?! True story. Fast forward four exciting and successful years later. They are now working in a 2400 sq foot space and this week TFPC is celebrating the launch of their latest paint collection! I'm super excited to share the news that The FAT Paint Company has collaborated with the unbelievably talented designer, Amanda Forrest. 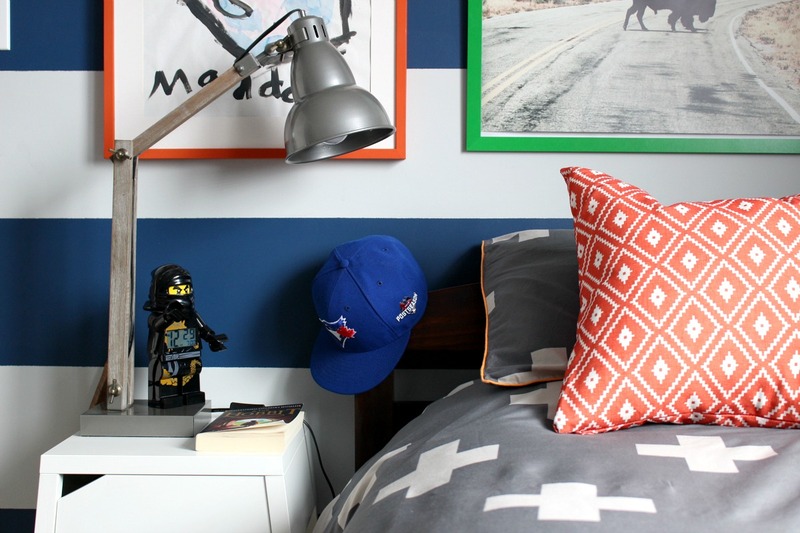 Together, they have created an exclusive palette of bold and inspiring colours. From a stunning pink, to a refreshing blue, to your go-to neutrals. 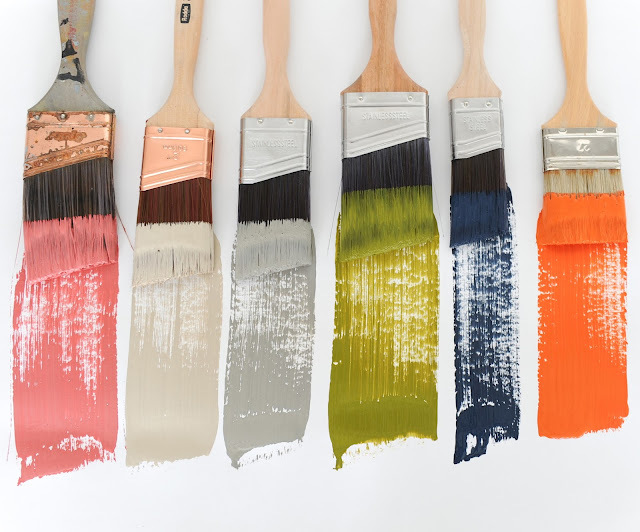 The six colours in this collection have you covered for your next project! With 15 years of experience in the design world, Amanda Forrest brings her knowledge of what it is that creatives are looking for, the proof is in her Instagram account. The colours that she created are reflection of her outgoing and energetic personality. I was able to try a couple of colours from the new line. This was the first time that I had ever used chalk paint and I have to be honest, I'm impressed. It's certainly different than your "regular" paints. I was amazed by the control you have, how smoothly it goes on (it does dry with a chalk like finish), and how great the colours are. TFPC isn't lying when they say that they wanted to go bold with this colour palette! I used Orangeapalooza on a frame in kiddo 1's bedroom. 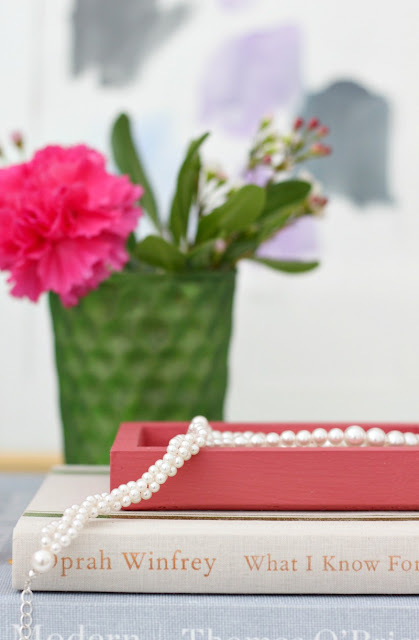 I didn't use the wax for this project because I loved the finish of the paint on it's own. 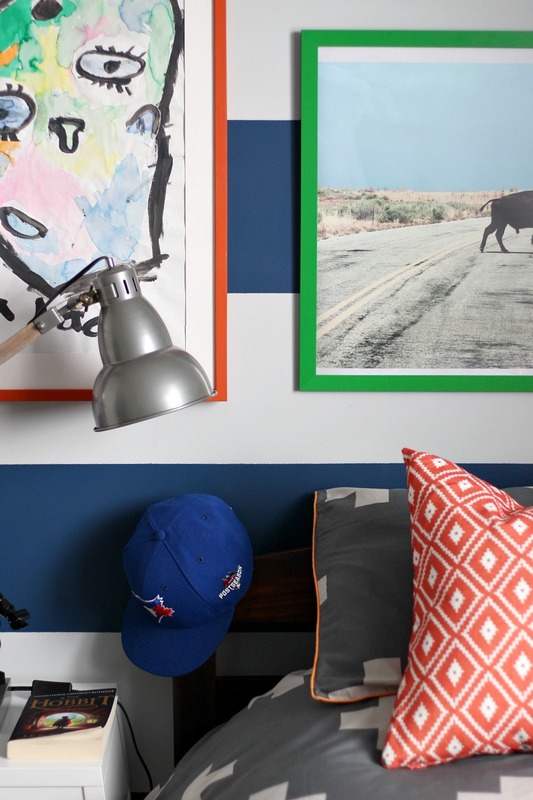 Such a fan of the orange + green + blue combo! 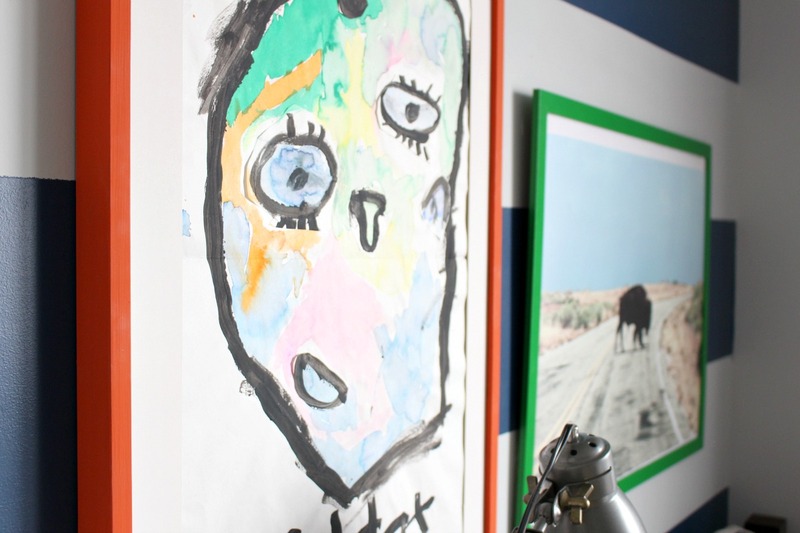 You can see more photos of pieces painted with the colours from the collection here. The beauty of chalk paint is that it allows you to easily distress your pieces with a little sanding. The wax (a little goes a long way) gives your pieces the protection that they need. However, I think that the most brilliant part is the minimal prep work that's required prior to painting and that the wait time between coats is only 20 mins! Of course, what's a celebration without a giveaway?! 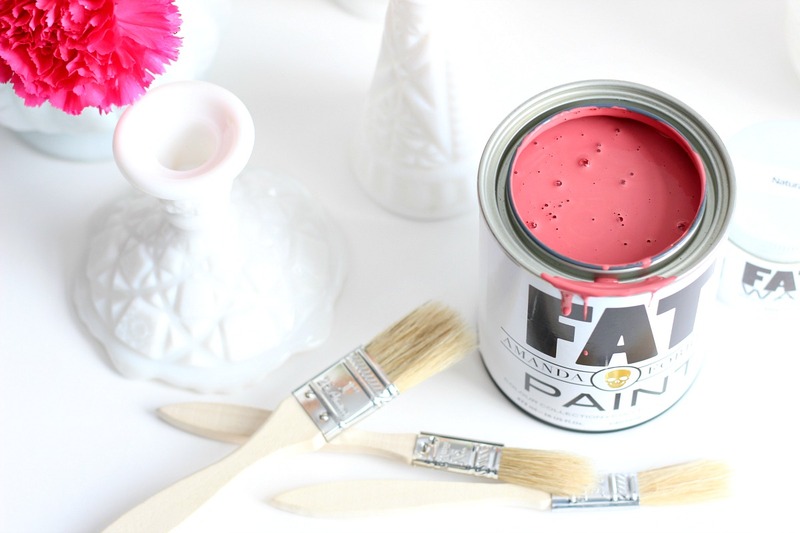 The FAT Paint Company wants to give one lucky reader the entire #AFxFAT paint collection in pints and a 200g jar of FAT Wax. But wait! That's not it! 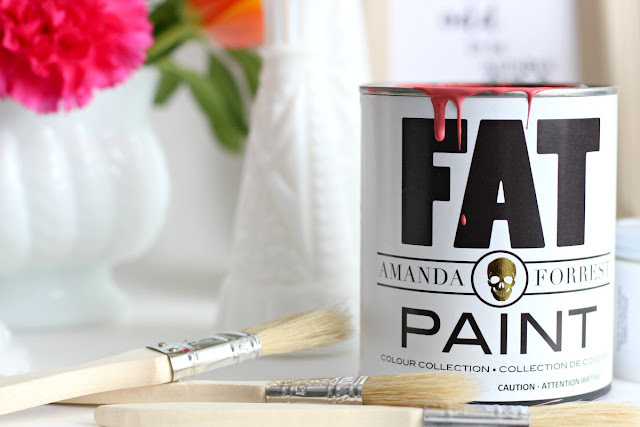 The winner will also win a room make-over consultation with Amanda herself! I know! To enter, follow the steps below. The giveaway is open to residents in Canada and the US and closes Feb 3/16 at 11:59pm EST. Good luck! 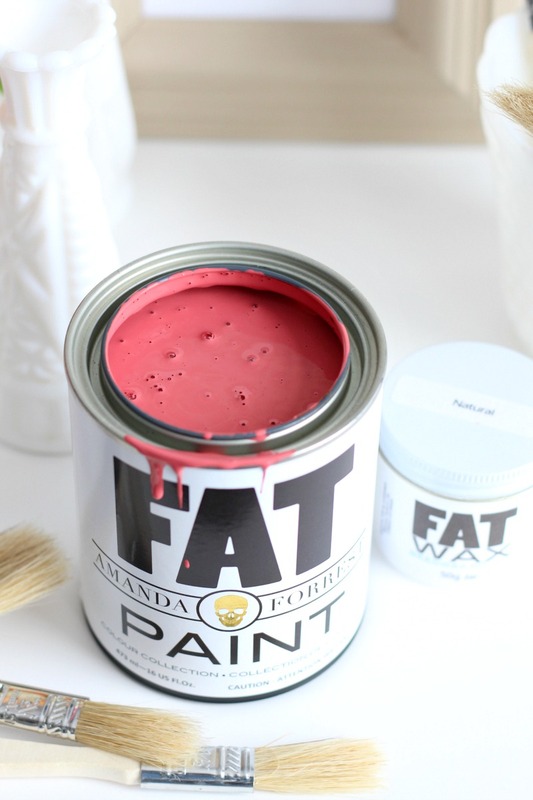 This post has kindly been sponsored by The FAT Paint Company, however all opinions are my own. I would use the Fat paint to freshen up my side tables in my bedroom as well as a few picture frames that are pretty mismatched at the present moment. :) Actually, I would create myself new projects just to be able to check it out. I've never worked with that paint but the course are amazing! And I love the packaging. Great contest! 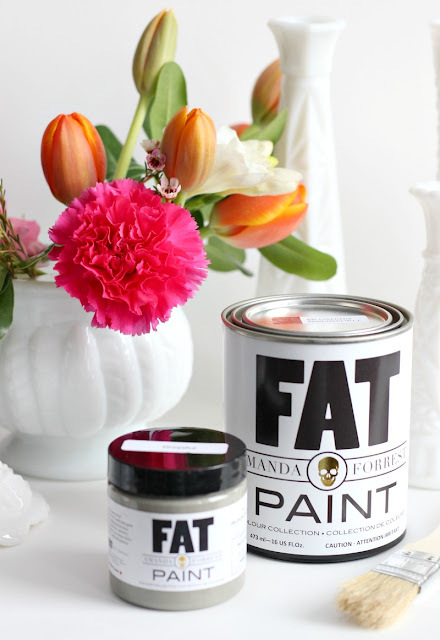 I love using chalk paint to transform furniture! 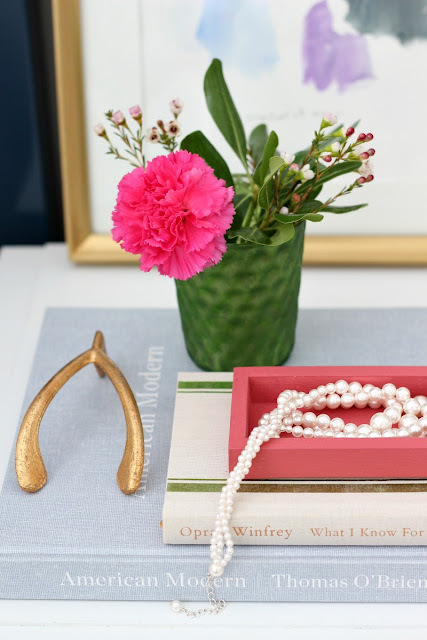 I have a few pieces of furniture I desperately want to update and have been searching for the best way to do it. 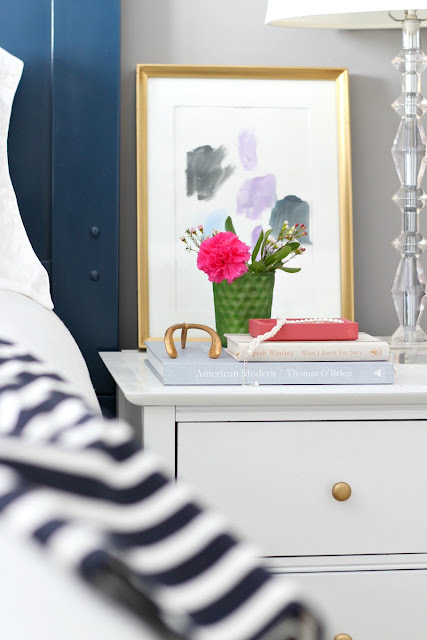 I would love to try this paint on a dresser I have! Thank you! We are building our own house and I just said to my husband yesterday, "we need help with paint -- I have no idea what to pick." 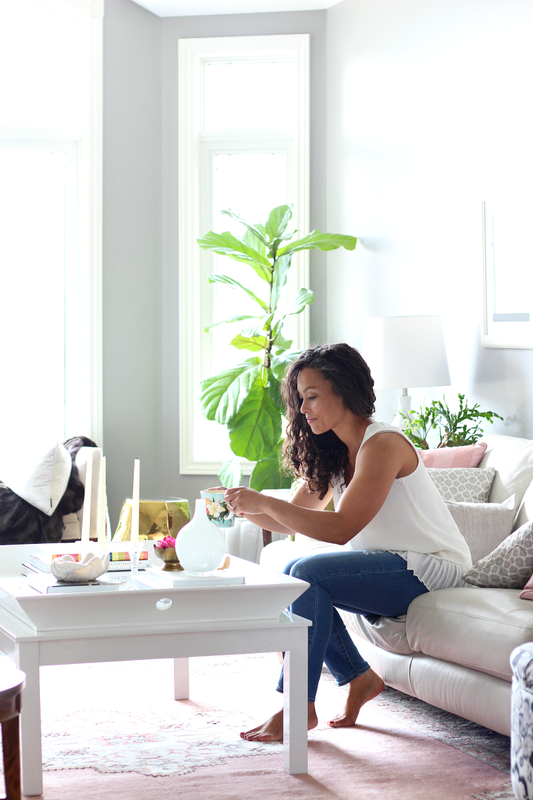 Amanda, her team, and paint would be such a wonderful bonus to any space in our dream house! I love the grey and would use this on my lower kitchen cabinets...we want to paint the kitchen...we would use the white on the uppers! I would use the paint in both of our bedrooms. Well I would LOVE to paint our dining room table but it would scar the hubby for life (what is it with men and painting wood?) so I'd tackle our hand-me-down dresser. Where to start!? ?...kitchen cupboards, bathroom cupboards, an outdated dresser, an old piece from my grandparents ..oh the list is endless!! 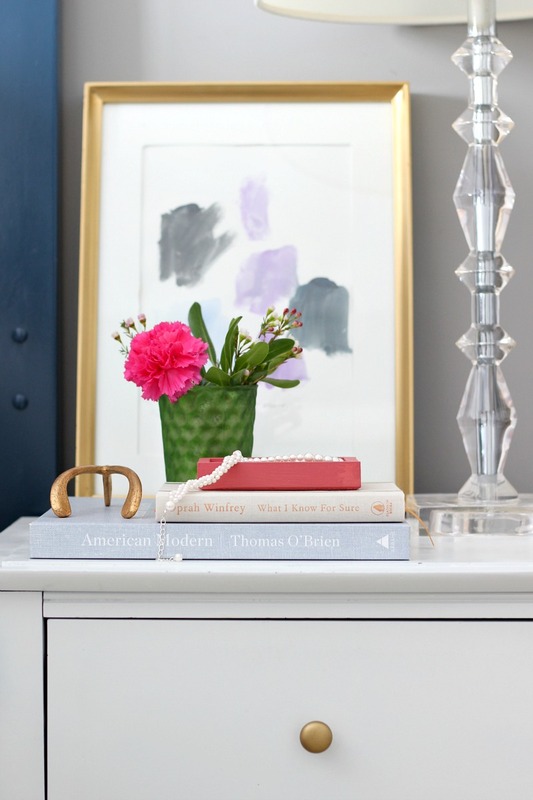 I'd love to try the paint on a couple side tables we have that are looking a little shabby. Would also love to do some frames for our daughter's room. I have this amazing buffet that I got at goodwill for $50, it has bamboo detailing that I love. I have been dying to chalk paint it, I really think it will bring out the detailing. 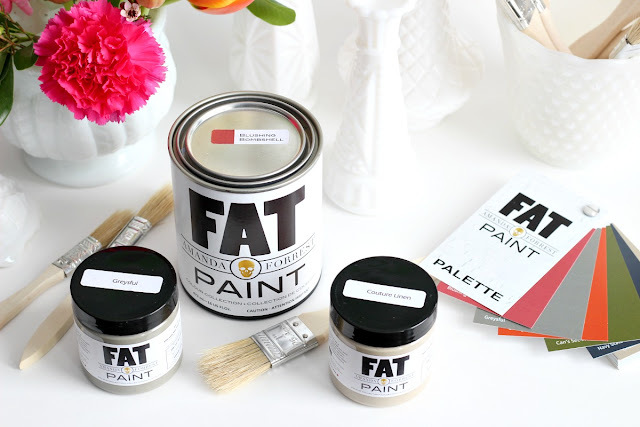 Fat Paint is the first chalk paint I ever used and still love it best to date. I've also had the pleasure of meeting Victoria and Brad! They are so lovely and kind. You can totally tell they are passionate about what they do. They have over come so many obstacles during their journey, including a fire of their first shop. I'm so pleased to see their success and the launch of this gorgeous collection. They have linked up with some pretty amazing people too, you and Amanda! I have too many pieces of furniture in storage and I'm hoping if I win this collection it will put a fire under my behind. So inspired by these colours! 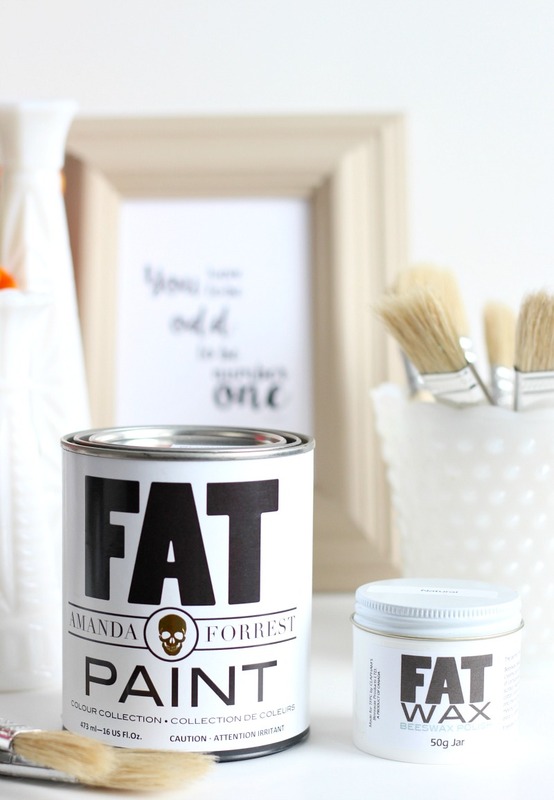 This paint would be ideal for a makeover for our tv unit in the rec room! Thanks for the opportunity to win! I moved into my house just over a year ago and had big plans for the spare room that is insultingly covered in the most unattractive tope. I have yet to get around to puting in some TLC in this space. So! This is exactly where I would apply these heart throbbing colours. 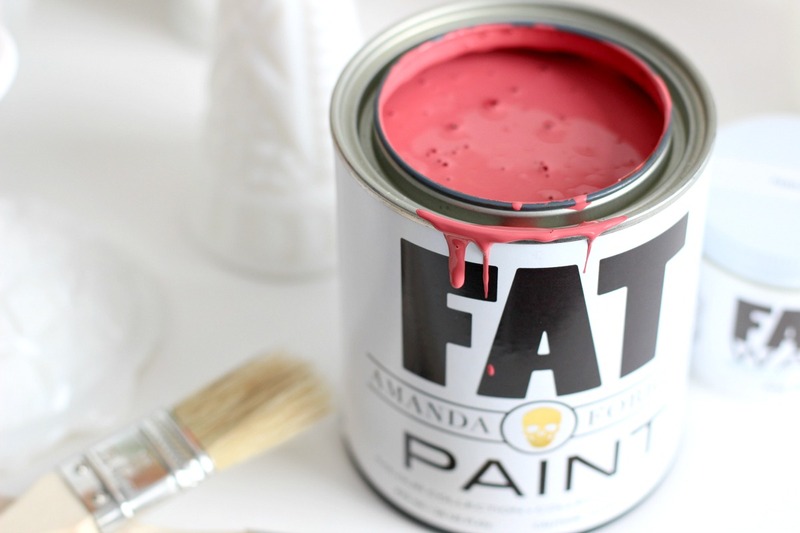 I plan to use fat paint to finish a headboard for our master bedroom as well as to add pops of colour around the house! Love the new colours and love fat paint! I would love to use this paint in my room :)! Pick me, pick me... I would use this wonderful paint to change the world. A world of color!